FreeLibrary.us Electrical Engineering Books Mechanical Engineering Servo Motors and Industrial Control Theory - 2nd Ed. 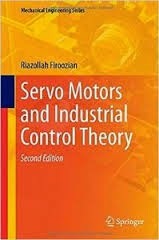 Servo Motors and Industrial Control Theory - 2nd Ed. Servo Motors and Industrial Control Theory is the only text focused on the fundamentals of servo motors and control theory. Graphical methods for classical control theory have been augmented with worked examples using MatLab and Mathcad to reflect the reality of the way engineers solve control problems in the field today. State variable feedback control theory is introduced clearly and simply, with practical examples that help students approach what can be seen as complicated problems with confidence. Servo Motors and Industrial Control Theory updated second edition includes expanded discussion of Nyquist and Root Locus stability criteria and the role of sensors, as well as new Mathcad examples. A range of parameters are introduced for each servo control system discussed, making this book a comprehensive learning tool for students and an accessible information resource for control system designers who want to keep their knowledge up-to-date. You can download Servo Motors and Industrial Control Theory pdf from any of the following links. If any link is dead please feel free to leave a comment.